This new track by Spiritualized is a bit of a slow burner; it takes a while to get its hooks into you. But once it does, the song penetrates deep into your psyche, its infectious chorus looping around in your head ad infinitum. Clunky, unwieldy title aside, The Road (Here It Comes) Let’s Go is the heavenly sound of Jason Pierce revelling in his cosmic American country soul influences and delivering a gorgeous, warm-sounding analogue lament that puts the firm emphasis on the spiritual in the widescreen Spiritualized sound. Sounding like it could have been written by bosom buds Keef and Gram during the course of a stoned, guitar-and-piano only songwriting session in Nashville with the Wrecking Crew providing able musical accompaniment, it’s a potent mixture of Dixie and narco that Spiritualized have made their hallmark over the years. There’s always been a pronounced gospel element to the band’s symphonic space rock and here, the emotive voices in the chorus are testifying in waves of harmony, providing a beautiful counterpoint to Pierce’s world-weary whine, whilst stabs of brass work to elevate the song to a higher plain. Lyrically, the track is a list of instructions that, if followed, allows listeners to find Pierce’s fictional house on the west coast of America. According to Pierce, he wanted the song to end in happiness but instead, it left with just a small trace of sadness. Well, if this is sound of melancholy, bring it on I say. 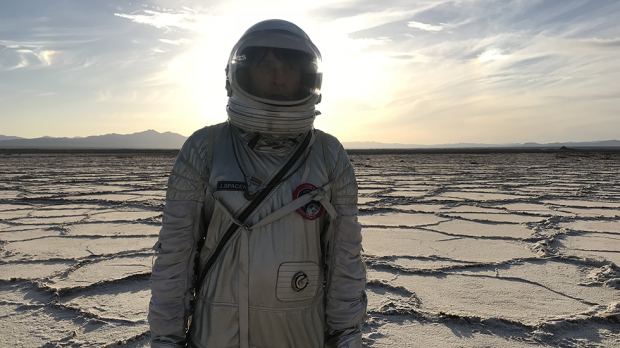 The Road (Here It Comes) Let’s Go is the third excellent single to be shared from And Nothing Hurt, Spiritualized’s first album in six years. On the strength of this kind of compelling evidence, we may all be in for a serious treat when Pierce’s home studio-recorded creation drops on September 7. I, for one, can’t bloody wait.